All food vendors who will be selling food items will pay a flat rate for booth fee. Includes one raffle entry and one mimosa. Will register and check in guests upon arrival. Will assist with distributing mimosas to attendees during event. Will assist with collecting tickets, selecting raffle winners and distributing prizes. Will assist vendors with set up to prepare their booths for expo. Will assist with venue clean up and break down to return Spaces back to normal set up. Will assist with venue set up to prepare the space for vendor expo. National Day of Empowerment (NDOE) is an annual signature event for National Urban League Young Professional chapters. This year, the theme is Building Black Wealth: Securing Generational Prosperity where we seek to create intentional space and opportunity to empower and support aspiring and thriving Black and other minority entrepreneurs and businesses. 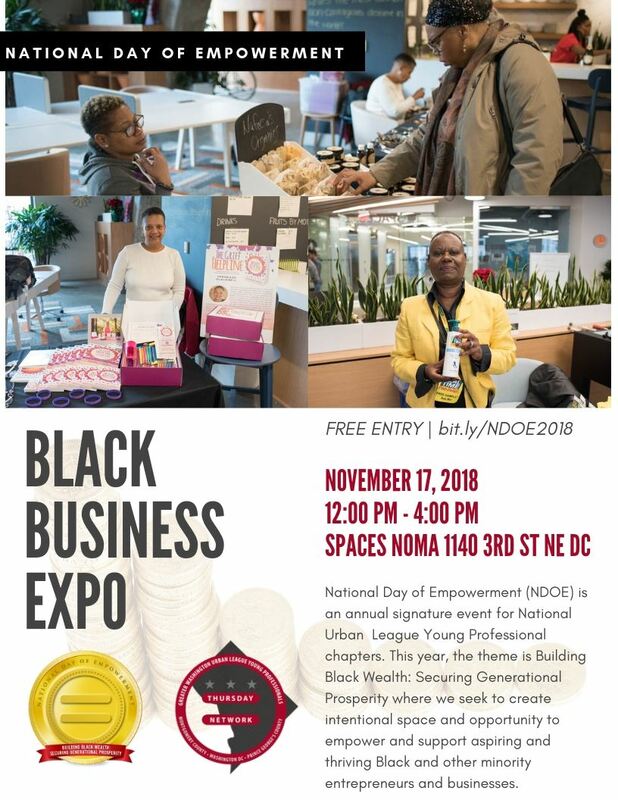 We plan to do this by hosting an entrepreneurship expo where Black and minority owned vendors can demo, display, and promote their products and services. The goal is to promote economic empowerment and provide a forum for entrepreneurs to engage with each other and the community. We want this event to increase the visibility of burgeoning and well-established businesses lead by people of color and ultimately, increase their patronage. The event Is free and open to the public with registration. Vendors are welcome to participate for a small fee. Please register via the registration tab.